What makes a braided power lead different is the addition of a tinned copper braid encasing the cable which is integrated to the earth wire. 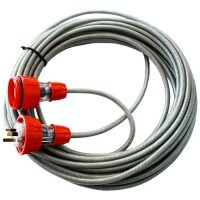 Having the braid sheath permanently connected to the earth wire ensures safety devices are activated when the lead is cut or damaged. Big Red Truck braided leads offer higher mechanical protection and feature IP66 rated plugs for safer operation in wet environments.